After working with the LCDuino-1 code for a while, I concluded that I’d have to build my own device(s) to accomplish what I wanted. Progress has been slow over the last year, but a base control unit (aka “interchange”), a battery operated remote, and auxiliary boxes for AB switching and sound processor inserts now exist. I took some of this work to the Burning Amp festival in San Francisco last fall. This post commemorates installing the first relays into the Orion ASP and having them controlled by the interchange and remote. The interchange runs off a wall wart, the remote has a 5V portable USB battery meant for extended cell phone power. The two units communicate via XBee radio tranceivers. 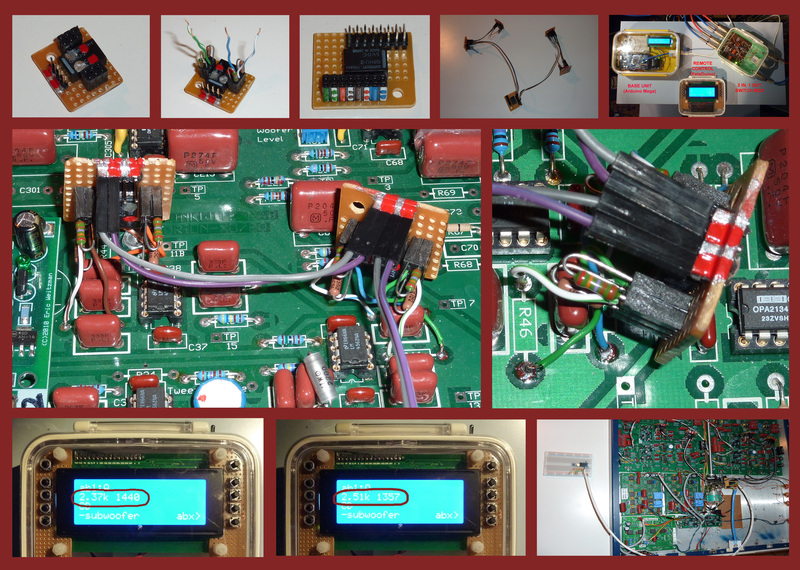 Each has an Arduino microcontroller board running code I wrote and an LCD display. Ethernet cabling connects the relays, buttons, LEDs, and so forth in the auxiliary boxes and the Orion ASP to the interchange. The interchange basically just flips relays upon command from the remote or from buttons in each box. With enough relays, the system could be used to compare amplifiers and/or different ASP builds by switching their inputs, outputs, or both, or to remotely change resistance and/or capacitance values in filters using relay-controlled decade-type boxes. In addition to all this flexibility and convenience, the interchange and remote are programmed to support blind ABX testing so alternate circuits, components, or even cabling can be tested for audible differences. Don Barringer wrote an epic post on the Orion forum last December explaining the changes he made to version 3.3.1 of the Orion ASP to achieve, as he puts it, “subjective neutrality”. Since I reverted back to 3.2.1 after implementing and not liking 3.3.1 last year, I’m only interested in trying a few of his changes. I implemented Don’s change #4. It lowers the midrange driver low pass filter cutoff from 1440Hz to 1357Hz. I believe Don’s intent was to reduce the midrange response ever so slightly in the octave or so immediately below the crossover point, as well as through the crossover region to the tweeter. I installed four DPDT relays in the ASP to switch the eight resistors R44-R47 between the 3.2.1 values (2.37k) and Don’s new values, 2.51k. The interchange works, and the new filter response seems to work for me too. Enjoy the photo mosaic that follows.